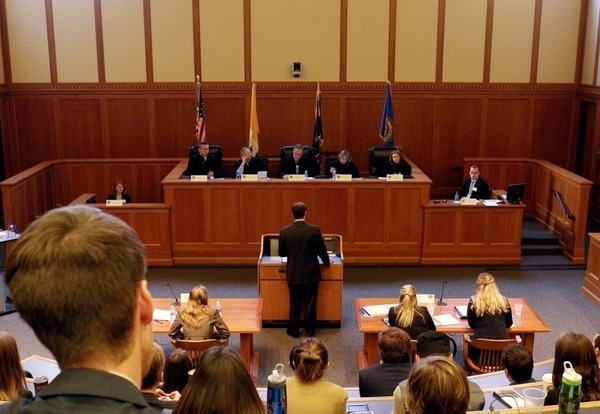 The Notre Dame Law School Moot Court Board recently hosted its inaugural National Appellate Advocacy Tournament for Religious Freedom. The competition was organized by NDLS students and was co-sponsored by the Program on Church, State & Society. Eleven moot court teams from across the country participated. Texas Tech University School of Law won the competition. Stanford Law School placed second and Dwayne O. Andreas School of Law at Barry University placed third. 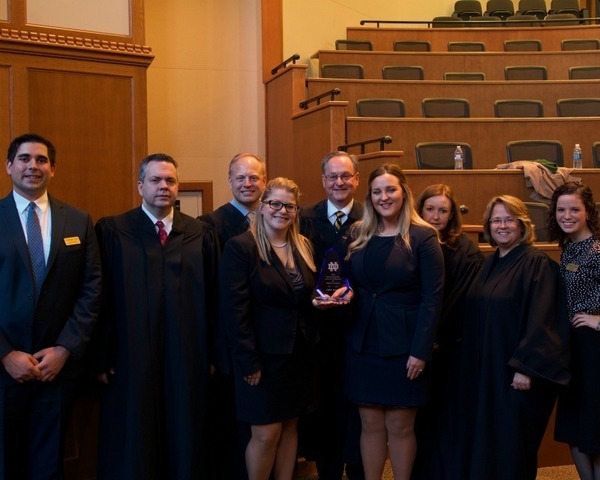 Ave Maria School of Law, J. Reuben Clark Law School at Brigham Young University, DePaul University College of Law, Emory University School of Law, Florida Coastal School of Law, and William & Mary Law School also competed in the tournament. Anna Caruso from BYU won the Best Oralist Award, and Mariah Mauck and Sarah Scrivner from Texas Tech won the Best Brief Award. The judges for the competition were Judge Michael G. Gotsch, Sr., ’79 B.A., ’87 J.D., U.S. District Court for the Northern District of Indiana; Thomas M. Fisher, Indiana Solicitor General; Robin Fretwell Wilson, professor of law at Illinois College of Law; Maxwell Goss, Ph.D, ’09 J.D., partner at Rossman Saxe, P.C. ; and Christine Venter, professor at Notre Dame Law School and director of the NDLS legal writing program. 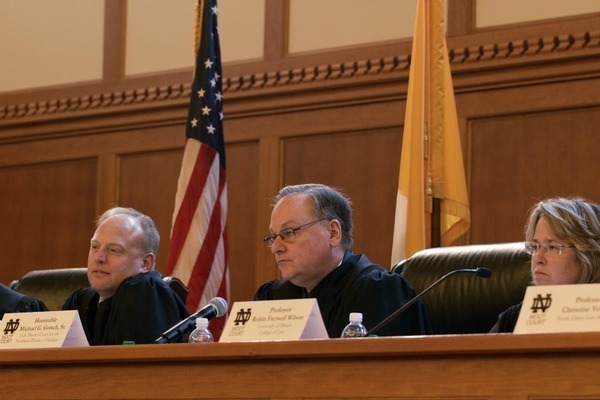 NDLS alumni, Catherine Dines, ’15 J.D., Matthew Enzweiler, Michael Mikulic, and Thomas McAndrew, all ’16 J.D., were also judges. 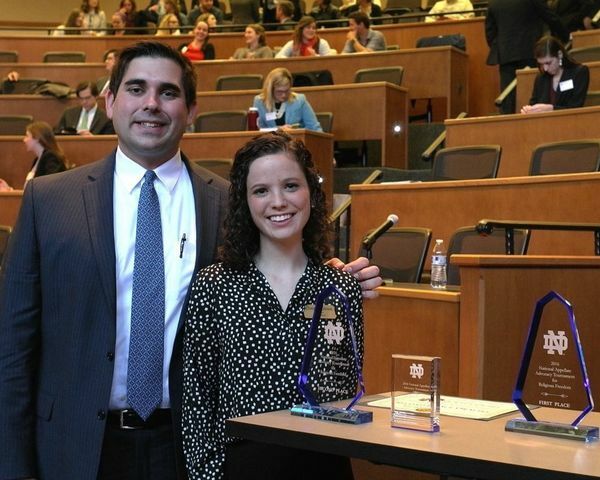 The Notre Dame Moot Court Board plans to host this tournament annually. “The tournament allowed us to showcase our board’s talent, welcome our national peers to our University, foster interest in the realm of religious freedom, and contribute to a legacy of service. It will be exciting to watch the tournament continue to grow,” Dines said. “With the institutional knowledge that Notre Dame brings to a religious-freedom event, coupled with the generous support of the Program on Church, State & Society, we knew that the tournament would find a natural home at Notre Dame. The zealous advocacy and passion for religious freedom we saw this weekend exceeded even our high expectations,” Ciulla said.